Boro were slain by the plucky Welsh minnows, Newport County and crashed out of the FA Cup in the rain. No high profile, high earning, fan-Tastic home game with Man City, then. And a second giant killing in one season seems more than careless. A massive night for Newport and a massive black mark for Middlesbrough. The Transporter derby proved a bridge too far for Boro. A last gasp equaliser for Newport set up a replay on a wet night in South Wales. A long, long way for the fans to travel and a desperate performance to endure. All this so soon after arguably the best away result of the season so far at West Brom makes it all the more perplexing and shocking. 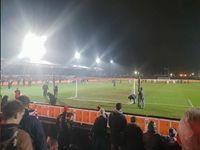 Standing in the open end getting soaked in a big old sports stadium is maybe a long way from a romantic notion but a midweek replay at Rodney Parade under the floodlights is probably the real bona fide cup experience. If not the Boro performance or result. With the Welsh rain tanking down the indoor Rodney's Bar was a welcome sanctuary for Boro fans, especially those with roofless seats swimming behind the goal. It was a spacious room with walls lined by rugby shirts collected by the two rugby teams that play here. Opposite was a big screen where we stood mouths open at replays of Clayton's handball at half time. Oops. Great to see Tony Pulis honouring the competition and hometown with a strong team. Not so great when Hugill limped off, followed by Britt. The Boro fans were nervous by confident after the victory on the road at the Hawthorns and lets face it we started pretty well. Boro began by passing the ball around fluently. The two former Northern Leaguers, Lewis Wing and Jordan Hugill were in the thick of the action. Wing shot narrowly wide and Hugill struck a post. Gradually Newport found their feet and with that large, noisy crowd giving them backing they started to run at us and pump the ball into the box. Just at the Riverside the no.7 Robbie Willmott was in inspired mood, pouring forward and putting in crosses that were real tests for our big men at the back. Only some terrific keeping by 40 year old Dimi Konstantopoulos spared our first half blushes. But that turned out to be only a stay of execution until after the break. We surely had to seize the game second half but instead Robbie Willmott was allowed to run unchecked and get a shot off that swerved away from Dimi's outstretched hand and into the net with a hollow thud. Anything but hollow actually in the home stand who went absolutely wild. Well, they would do. Still, plenty of time for Boro to get back into it. But then came the blows to Hugill and Britt, double goal hero from Saturday. Gestede and Fletcher were the final subs after Van La Parra had replaced Paddy McNair at half time. At no time did Van La Parra look to cope with the conditions. It was left to Howson and Clayton to drive forward but time and again they came up against a Newport wall and that was the end of that. A corner to Newport and former Hartlepool forward Padraig Amond delivered a quite brilliant and unstoppable first time finish. 2-0. Total disaster. Boro huffed and puffed and finally got one shot on target. Just one. A nightmare in Newport was complete when the referee blew the final whistle. Little Newport now had a dream tie against Manchester City at historic Rodney Parade. “You don't know how much this means to us,” one home fan told me as I skulked off afterwards towards a dry darkened room somewhere. At the end of the game Boro players came over to applaud the travelling fans. There was a very negative reaction from those drenched behind the goal. Not surprisingly. There was a reaction from some of the players to the abuse and then it all went silly on social media. What really matters is that Boro have crashed out of the cup. Once more to lower league opponents. We will not now get the prize of Man City at the Riverside. From the highs of the Hawthorns we have the lows in the rain of Rodney Parade. We face a stern test in Leeds at home on Saturday and have to regroup again and possibly field an injury reduced and certainly confidence reduced side. We must come together again and not let Leeds United take advantage. We are out of the cup but we must not drop back in the League again. What a test.